Cooling a home takes a lot of energy–especially in Florida. In fact, air conditioning in Florida can account for 40% or more of your utility bill. Luckily, there are several ways to help lower your utility bill and the energy you use each month. One of the most successful ways is with a new thermostat. A thermostat is a device that controls the temperature inside your home. These devices can range from your old-school mechanical thermostats to high-tech Smart thermostats. 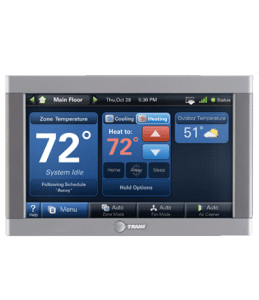 Below, the HVAC experts at Bertie Heating & Air Conditioning has compiled what we believe are the best two types of thermostats for Florida homes. A Programmable thermostat is great for busy Florida families. A programmable thermostat allows you to schedule the temperature in advance so you can revolve the temperature in your home around your weekly schedule. For example, if your home is not occupied during the day because of work or school, this thermostat will allow you to set the temperature higher during the day and lower in the evening. A smart thermostat, sometimes known as a connected thermostat, is relatively new to the HVAC industry and is great for Florida homes. These thermostats can hook up to the Wi-Fi in your home and can be accessed from any smartphone, tablet, or computer. Many of these thermostats can also calculate the humidity and temperature outside and adjust the air conditioner accordingly so you have optimal comfort in your home. Smart thermostats work similar to programmable thermostats because they too can be programmed to turn the temperature up when you are not home and down before you are home for the evening. While these thermostats are typically more expensive, they have the power to control your home no matter your location. At Bertie Heating & Air Conditioning, we are Trane Comfort Specialists, meaning we meet Trane’s high standards and are recognized as one of the best in installation, service, customer satisfaction, and employee training. 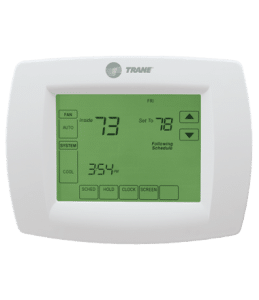 Trane offers a variety of programmable thermostats and connected thermostats that are perfect for any Florida home looking to save energy. To get in contact with the team at Bertie Heating & Air Conditioning about installing a better thermostat for your Florida home, contact our team today.